Among many varieties of memory devices, Industrial CF6 cards are very popular for embedded devices in such fields as medical, military, gaming, automotive and POS applications due to their cost effectiveness, reliability and stability. Industrial CF6 Cards significantly boosts the transmission efficiency up to 115/80 MB/ second. The new series also considerably expands its capacity up to 64GB for the SLC version making it the best choice for industrial computer and automatic storage. This new series of CF memory cards takes built-in value-added functions and other features of SLC as its main axis, and adopts the standard 50-pin connector. The data transfer mode is up to PIO-6, Multi-Word DMA-4 and Ultra DMA-7, all of which are compliant with the CFA 6.0 specifications. 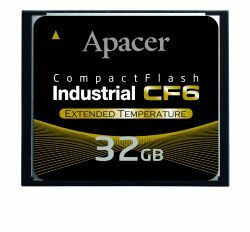 Thanks to its PCMCIA-ATA function and compatibility that support 5V or 3.3V power supply, the sixth-generation CF memory cards provide superb convenience in terms of matching with systems and expansion of capacity.